I receive many, many questions from people who are interested in homeschooling with Montessori. Even though I’ve addressed this topic before, I thought it would be helpful to answer some of these questions in one big, comprehensive blog post so that I can refer people to it as a resource. It ended up being pretty long, but I think it’s worth reading to the end – even if you don’t homeschool, you’ll find some great info here. I’m going to be very honest, and although some things I say might seem to be discouraging, I think having all the pros and cons will help people make more informed decisions. Throughout the post, I refer to different online resources, but I’ve kept all those links until the end. Here goes! Where do I learn how to use the Montessori materials? 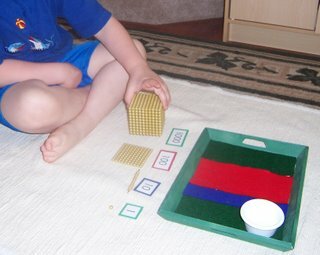 Each time you show the child how to use a specific material, it is called a “presentation”. Presentations should be reviewed and practiced by the adult before working with the child. Each of our materials contain brief instructions, and there are instructions and albums to be found online and from reputable Montessori companies (see the end of this post for links). Many of the Montessori materials have a similar format. Once you know how to present a set of nomenclature cards, for instance, you can use the same method to present any type of nomenclature cards as long as you familiarize yourself with the content of the cards first. Some websites have albums available online, offering step-by-step instructions for presentations. Please see the end of this post for links to reputable online Montessori albums. Online albums can be a great resource, but I also recommend that any parent who is serious about homeschooling with Montessori purchase printed or printable albums. I only offer two albums right now: Natural Science 6-9 and Geometry 6-9. I do have plans to make more but please do not ask which ones and when. If you are subscribed to our email newsletter (top right of any page on our website), you will find out as soon as other albums are available. There are high-quality, trustworthy albums available from several different sources. They can be pricey, but they are an extremely valuable resource. The best albums (like the ones I mention at the end of this post) include not only step-by-step instructions, but the theory behind the materials and lessons. I also highly recommend that if at all possible, homeschooling parents take a Montessori certification class. These are available at training centers around the world, as well as online by reputable organizations. It can be quite a financial investment, but the knowledge gained is priceless. (See the end of this post for resources). Do you offer instructions for your materials? In the course of creating my materials, I have included very brief, basic instructions with most of them (either right in the PDF or sometimes in a separate PDF). However, these are not a substitute for the step-by-step, in-depth information that you would receive from an album, especially if you are new to Montessori. Do your CD-ROM Collections include everything I need for a Montessori homeschool classroom? My CD-ROMs do include almost all the printable materials you need for a Montessori classroom (of course, you have to print them!). No classroom – at home or at school – would have room for all of my materials if they were printed, laminated, cut, and put into containers. It would be hundreds and hundreds of printed pages (thousands and thousands of cards, once cut apart). Rather, materials can be printed as needed and then stored away when they are not in use. However, there are many more materials needed for a Montessori classroom besides the printed ones – we refer to them as “wooden materials” since most of them are made from wood. I do not sell those. In a preschool (3-6) class, the ratio of wooden (or other hands-on) materials to printed should be about 80% / 20%. In an elementary classroom, that can be reversed. In elementary, the areas that truly need hands-on (wooden or bead) materials are math and geometry. Otherwise, printed materials can be used almost exclusively in every other area, sometimes with the addition of small objects or other hands-on materials to flesh out the work. Does Montessori really work for homeschoolers? The answer to this, very honestly, is yes and no. Many Montessori materials and ideas can be implemented in the home. Of that there is no doubt. The end result, however, is not going to be Montessori in its exact sense. Parents should not have the goal of re-creating an entire Montessori classroom in their homes, and really, it’s not necessary to do so. Montessori classrooms are created for use by a certified teacher working with a large number of children. Since that is not the situation with most homeschools, it’s more beneficial to create a small Montessori work area with whatever materials the child is using right at that time. (See picture: my son works with a homemade “Intro to the Decimal System” tray in our homeschooling area). Can homeschooling with Montessori be done on a budget? You can certainly decide not to spend a lot of money, and instead make or borrow materials. Some people homeschool using Montessori principles (like following the child and encouraging independence) but refrain from using the materials because of their cost. Certainly, traditional homeschooling can be done inexpensively. I have heard many stories of families who buy used textbooks and visit the library frequently; they spend very little on actual homeschooling supplies. But I would say that true Montessori homeschooling differs from this approach. However, I don’t recommend buying thousands of dollars of materials right at the beginning. Start small; buy a few things, make a few things, and always be on the lookout for sales, specials, and things you can buy at yard sales, garage sales, and resale shops. eBay is also a great source of less expensive (although often lower in quality) new and used Montessori materials. Can I mix Montessori with other approaches? Many people choose to add Montessori to the mix of traditional homeschooling, Charlotte Mason, Waldorf, or other educational method. This is certainly a valid choice. Each homeschooling parent will have to decide just how Montessori will work for them. Will they use Montessori only? Will they use traditional textbooks and workbooks, and bring some Montessori materials into that situation? Will they mix Montessori with other non-traditional methods of education? It will look different for every family, and that’s okay. It may also evolve as you grow and learn with your children. What if I try Montessori and it doesn’t work for me? Some people try doing Montessori in the home and find that they don’t work for their family. That’s fine. There is no doubt that the Montessori method is a valid one, but when you use only parts of it at home, you may find that they do not work out for you. Perhaps the cost is prohibitive, or the mix of ages you have in your home make using the materials difficult. Please do not feel guilty or feel like a failure. What I do recommend – rather than giving up right away – is taking some time to evaluate what you’ve done so far and what changes can be made. Maybe you need to do a little more research on your own time, reading up on Montessori theory and practicing presentations. Maybe you need to limit the amount of time spent with Montessori materials each day, putting the materials away when you’re done. Maybe some of the materials can be saved until children are older or in a different learning stage. Keep observing and refining until you find a balance that works for your family. What are some common missteps to avoid? There are two that I think are very important. First, do not buy or make too many materials right away. It’s hard to find space to store them or time to learn how to use them. In the Montessori Basics posts, I have lists of recommended materials for all the age groups: infant/toddler, primary 3-6, elementary 6-9, elementary 9-12, and middle school/high school (called “Erdkinder”). (See links at the end). This should be the starting point for any Montessori homeschooler. But you don’t need to buy everything all at once! Less is always more. Second, I think that many homeschoolers present work before the child is ready for it, or in the wrong sequence. In a Montessori classroom, the child will progress naturally from one work to the next so that when they do more advanced work, they have a solid foundation. At home, there is the temptation to buy one material and show the child how to do it without the child having done all the other materials leading up to it. Naturally they are overwhelmed and unable to do the work. That leads to the feeling that Montessori “isn’t right for our family”. Okay, how do I know what work to do and when? This is another way that albums come in handy. Albums are arranged with the work in order of difficulty, so that one work follows another. Another way to know the sequence of work (and keep track of it) are through the Comprehensive Lists that I offer at my store. I recommend printing one for each child and using it both as a checklist (to keep track of what you’ve already done) and as a way to know the sequence of the materials. To know when your child is ready for a certain material, you can look at several different factors. First, what material has your child already completed successfully? What types of materials interest your child and hold their attention? In what areas do they need some more reinforcement? What kinds of activities do they seek out on their own? Careful observation will help you determine the right material to do next. Interested in this history of homeschooling with Montessori? You might like this article: Montessori and Homeschooling: Here to Stay? If you are considering homeschooling with Montessori, please take the time to thoroughly read all of the Montessori Basics posts and all of the Homeschooling posts. They contain a wealth of helpful information.